Bought Gunbot ? Have No Time to put your head into strategies and setup's and config's ?? Want to use our tried and tested profitable Trades making Setup ? That Makes you money While You Sleep , Play , Eat Or Watch Movies ! What Are The Requirements ? Minimum 0.75 BTC balance to Trade In Your Account . All The Setup Shall Be Done By Our Team . You'll Be Added A To Premium Group / Channel On Crypto Currencies For Updates . 100 + Profitable Trades Per Day , Fully AutoPilot . I had a very bad experience in my automatic trades in the various markets of money, forex and crypto. One time fee of 0.2 BTC will be paid to buy the setup. This includes all future updates. You can use an Escrow if you decide, but you are responsible for all fees. Send 0.2 [btc] to 1DhWoZQKVc6rAaJX3S1agyDwA5gFBb2LB3. Mention the transaction ID in a message to me. Otherwise, catch me on Telegram and we can chat live. Any trades for today and yesterday when markets are more stormy ? Yes Around 100 trades on this downside market. Feel free to Pm me if you want more Updated Stats Of any given Date . Can anybody who got the service please write a review? +1 for using Sids Auto-Config service. He was very professional about answering my questions about this service and setting up Gunbot and before I bought a license and his service. This was two weeks ago and has been profitable and looking like to continue it in hte future. Sid is helpful in understanding how the bot works, how to check the settings and general market sentiment during the days. Definitaely recommend as this has been an interesting thing to learn. Any other reviews or reports on this? Yes, I see he provides a very interesting set-up. Is the configuration completely autopilot? I believe Crypto Sid is touting about 4% a day ROI. What are the supposed returns for Culture Crypto? Seems like a great service for the price anyway, but I wonder if it's a little different than what Crypto Sid is offering. Hey Big Bro , Why Are you hijacking This thread ? Pm me For Reviews Buddy . 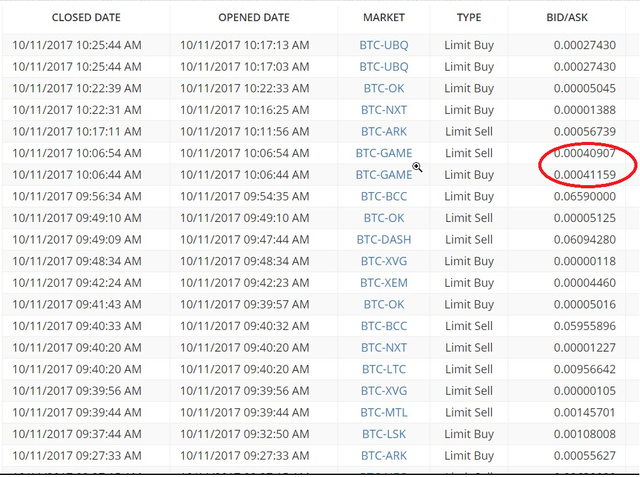 Bot Sold For a Small Loss , That Happens when Bot has open Buy orders Not Filled Fully . If u see the Timestamp , You'll See It Happened Over Seconds . At first I was apprehensive about purchasing the Auto Pilot but 2 weeks in I can honestly say this is service that is worth the asking price. Syd knows what he is doing, the bots do what they are meant to do which is make BTC. However more important his regular updates and market tips are now becoming a crucial aspect to my portfolio. Don't waste hours tinkering with bot settings, have them optimised for any market climate by an expert. Many thanks to Syd for his hard work and constant attention. Sure, but he's asking 0,2BTC which is equal to $1200. Pretty much for a bit of configuration settings, don't you think? Perhaps if you're investing 100K with Gunbot it's a good idea, but I doubt that's the case for most. I already have the bot purcahsed, i hv them configured and running for poloniex and for cryptopia, i want help in just configuring the strategies to make it profitable. what will be the cost for just that. Hi Whizzy, Are you still looking for help? Is the config service still available? Am interested.